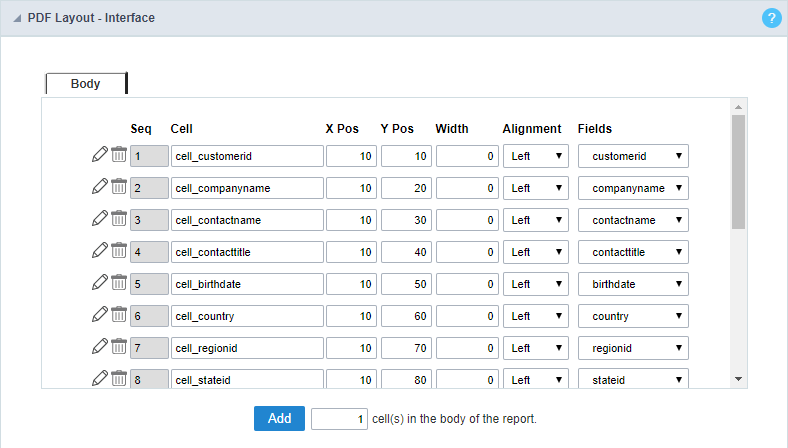 Using this interface you can define the display layout of cells containing the values of the fields in the body of the report. Seq : Sequential number of cells (ascending order). Pos X : Sets the abscissa of the cell. Pos Y : Sets the ordinate of the cell. Width : Sets the cell width. Alignment : Sets the cell alignment. 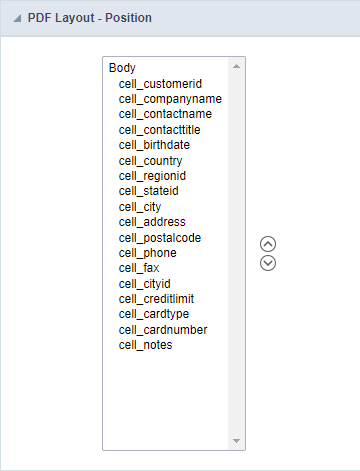 Field : Here you have to select the field that will be displayed within the cell, according to the application SQL. 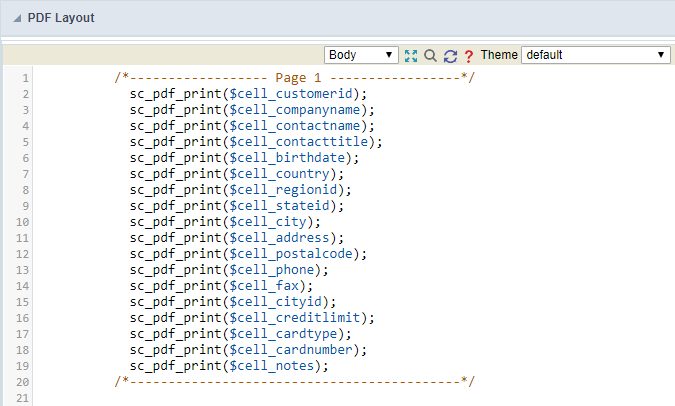 Scriptcase creates the codes automatically, so by changing that within the option “code” you will assume the PDF creation PHP code. Configuration interface of the PDF Code. The application “Report PDF” was developed based on a library called TCPDF, so that you can use the available library methods or a corresponding macro from the table below. In order to use some method you must use the $pdf object, for example: $pdf->AcceptPageBreak(parameters). AcceptPageBreak sc_pdf_accept_page_break Accept automatic page break. SetCreator sc_pdf_set_creator Sets the document’s creator. This interface allows you to define the display order of the fields (selecting through the arrows next to the right frame). Configuration interface of the PDF fields placement.